Orange season is done here, but I was able to get some good pickings off the trees and try the next thing on my list… marmalade. 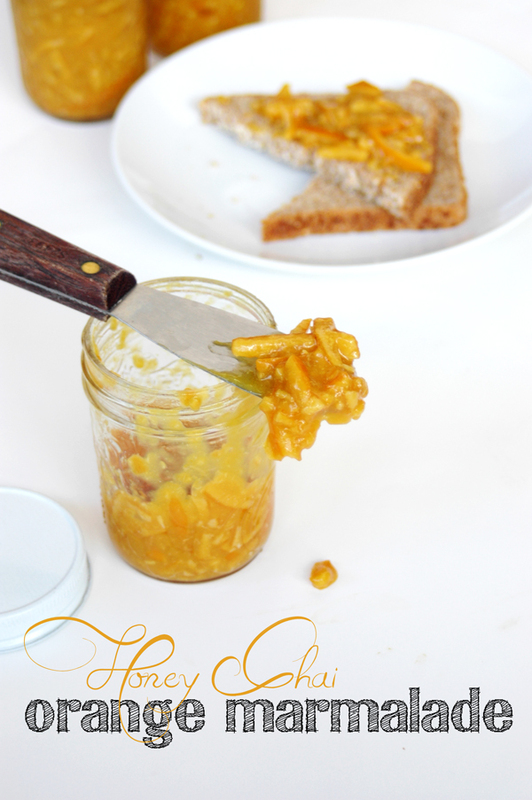 I never liked orange marmalade… until I made it myself. I have grown to love the tingling flavor and beautiful golden color. It is especially delicious with almond butter and raw honey on sourdough bread. Last year and this year I’ve been on a mission to use these beautiful balls of sunshine as much as I could. I’ve made Crispy Orange Chips, Tangy Orange Powder, Candied Orange Spice Peels, Homemade Orange Extract, Honey-sweetened Orange Curd & Orange Curd Bars, Honey-sweetened Almond Orange Shortbread Cookies and some fantastic Honey Orange Marmalade Rolls using my homemade marmalade. I still have a looong list of recipes and ideas to try, but they will have to wait until next season. Oh, before I go on about the marmalade. I want to do cover two things… 1) announce the 3 winners of the Safe Harvest Seed Bank Giveaway and 2) talk a little more about the 7-Day Real Food Challenge. First, thank you everybody for participating in the giveaway and please give a round of applause to… Julie Cox (Liked Just Making Noise on Facebook), Krissa Jeldy (Liked Just Making Noise on Facebook) & Esther DeWaters (Liked Just Making Noise on Facebook). Congratulations ladies!! I know you will enjoy the seeds. I have not planted mine yet, but making plans to do that in the next couple months. Woohoo! Next, the 7-Day Real Food Challenge… I am really looking forward to it. Why? Because it’s something new and a change of pace for my family. I’ve been cooking and preparing real food for several years now, but every once in a while I get into a runt. If you are finding yourself in a runt too… come join us! That’s where the 7-Day Real Food Challenge comes in to help! With 29 bloggers (including me!) on the support team, along with a full grocery list already prepared and recipes for all the meals for the week all done and ready for you. Gosh, how many of you have had your grocery list done by someone else for once? Me, never! Nice having the week off from making my grocery list! Anyway, I really hope you all will seriously think about it and join us! It will be great, PLUS there are several awesome giveaways for for those who join. 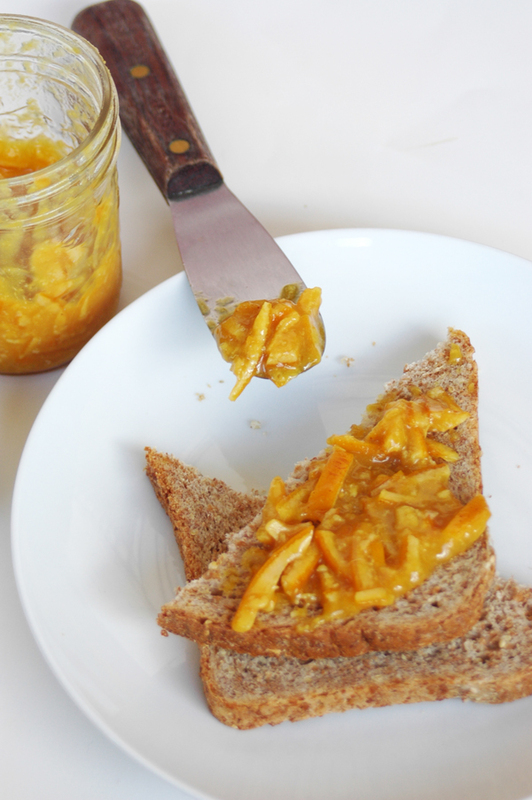 Okay, now… let’s talk about marmalade. 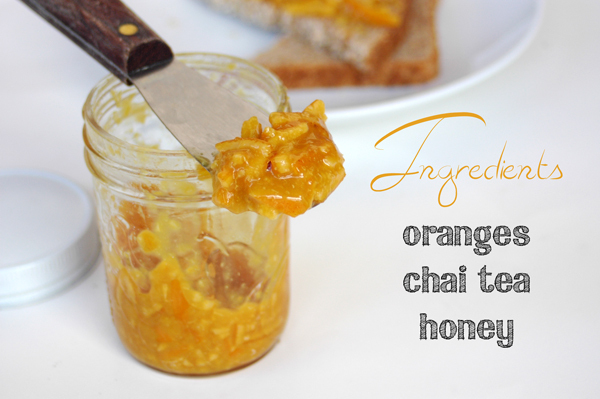 When I was googling around to find a good recipe for orange marmalade… I was inspired to try chai spices to give the marmalade some depth and character. I used Black Chai Tea from Bulk Herb Store, but you can use whatever you have on hand. 1. Wash the oranges. It is best to use organic, if possible. 2. Cut 5 oranges in half. Cut out the center white meat (the part that runs down the middle of the orange) and remove seeds. Do this over a bowl to catch the juice that will drip out. Discard the center white meat and seeds. 3. Set your cutting board on a large plate or flat bowl to catch the juice while slicing the oranges. 4. Slice the oranges into very thin or chunky slices. 5. Put the sliced oranges and all the juice into a large stainless steel pot. Add water and bring the mixture to a boil, stirring often. 6. Put 4 Tbsp of Black Chai Tea into a tea ball or bag and add into the mixture. Allow the mixture to a gentle boil and cook down for several minutes. Stir it a few times to prevent burning. 7. Add the honey and stir well. Bring the mixture down to a high simmer or keep at a low boil. Allow it to simmer (or boil) for about 30 minutes to 1 hour, stirring it often to prevent burning. 8. After the mixture has been cooking for 15 minutes, stay close and start stirring the mixture more frequently. It will start to thicken pretty quickly, so keep a close eye on it. Scoop a small amount of marmalade onto a cold plate, let it cool completely. Rub the marmalade to test for thickness. – If watery, continue cooking it. – If too thick or hard, add more water or tea and cook gently. – If firm (neither watery or hard), it is done. Turn off heat. Use a rubber spatula and draw it through the mixture. If the mixture fills in the space created by the spatula very quickly, it’s not done. When the mixture is almost ready it will fill the space more slowly, leaving an space for a few seconds before filling in. Keep in mind that the mixture will thicken even more after it cools. So, don’t over do it! 10. Once the marmalade is done, move the pot away from the heat. Juice the last remaining orange and add it to the marmalade. Stir, pull the chai tea out and let it cool. If you think that you overcooked the marmalade and its too thick, simply add more water, chai tea or orange juice into the mixture. 11. 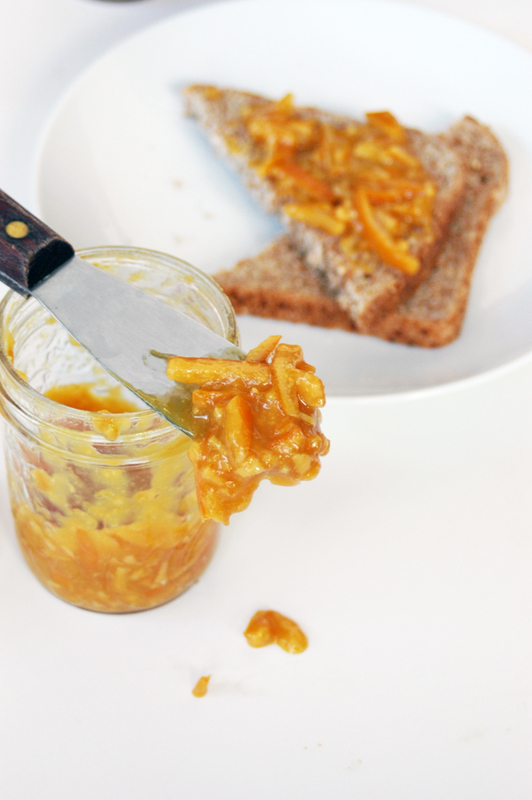 When cooled, spoon the marmalade into jars and put them in the fridge overnight to cool and set completely. The marmalade can be store in the fridge up to several weeks or store in the freezer for up to a year. 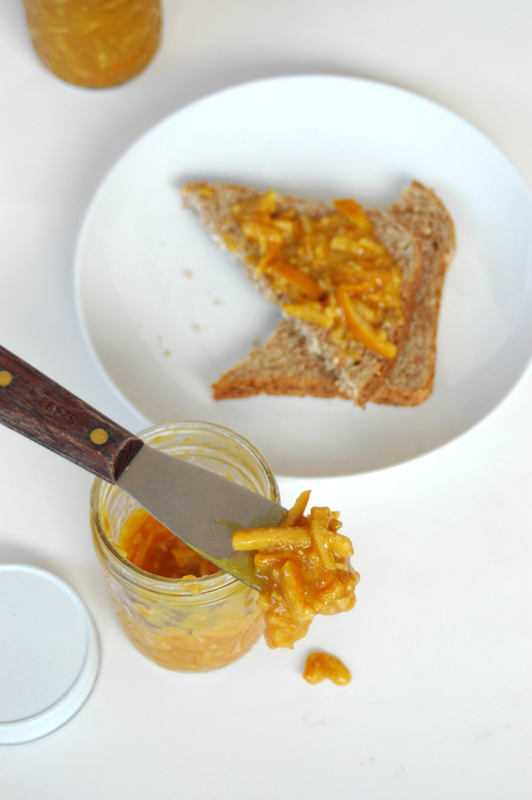 I’ve had a jar of marmalade sit in my fridge for almost 3 months and it still tasted great! What do you think? Would you make this? I am thinking I want to try making lime marmalade… never seen or heard of that, but why not?! « Homemade Natural Deodorant That Works! Thanks so much for this recipe! I just made your orange curd recipe a few weeks ago, but still had a bag of oranges from our tree to use up. We have honey bees, so this recipe is a great for our wanna-be-self-sufficient lifestyle. I tweaked your recipe a bit; I only had one tea bag of vanilla chai, so I brewed it in one of the cups of water called for. I also added a sliced lemon. 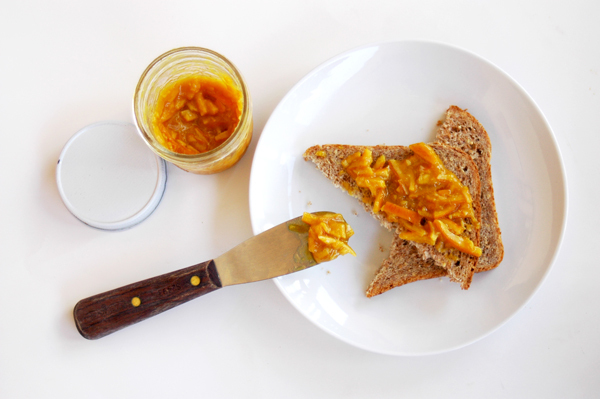 I’m like you…not a big fan of marmalade, but this is fantastic. Thanks again, and keep those great ideas coming!